Myself and Nick were recommended Stella Virdi by a friend of ours. So we took her recommendation and used Stella for our wedding, which took place yesterday 20/07/18. Our ceremony was in a pretty town hall garden and reception in the villa that we stayed at for the duration of our stay in Cyprus. I can honestly say we have been in the safest hands. Stella has been amazing from the beginning. If anyone is thinking about getting married in Cyprus, you must use this amazing lady; she is an excellent wedding planner. Stella is very professional and offers advice and guidance all the way from start to finish. Highly recommend she made our day the best ever. I just wanted to say a huge thank you for everything you did to help make our dream wedding a reality!! We couldn’t of had a better day and everything was just perfect from the beautiful church, stunning venue, horse and carriage, dj, photographer, videographer and the fabulous double decker wedding bus all of which you organised amazingly for us. 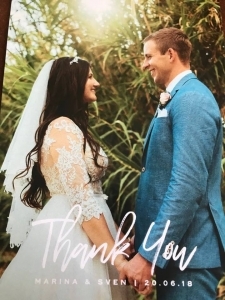 Myself and new husband Shane are truly grateful for all your hard work and we really couldn’t of done it without you!! It was such a pleasure meeting you two years ago when we visited the beautiful island of Cyprus for the first time. You were so lovely to us and nothing was too much for you. 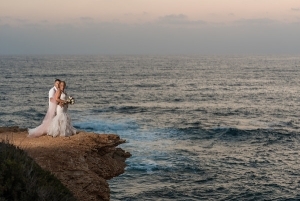 We loved looking at all the venues with you and it made us sooo excited to get married in Paphos and knew we were making the right decision. 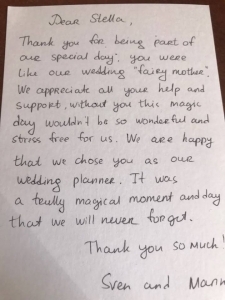 We knew as soon as we met you that you would do anything to make our wedding day perfect for us and you certainly did that!! You were always there to help. I would recommend any of you brides to be to pick Stella as your wedding planner. You will be amazed at what she can do!! It was lovely getting to know you and hope to stay in touch!! 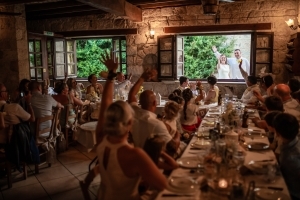 Married May 2015 – St Paul’s Pillar Catholic Ceremony, reception to follow at the Annabelle Beach Taverna. All the way from Dubai for an easy and stress free wedding in Cyprus. Dubai residents Joy (from the Philippines) and her new husband Steve (from the USA) married at Paphos town hall on the 12th September 2013. To add to their special day they had a fun photo-shoot after the wedding ceremony. The Exclusive wedding team wish to congratulate them and hope they have a long happy, healthy and prosperous marriage. Once you are married here in Cyprus. We will ensure your marriage certificate will be stamped and attested by all relevant ministers and necessary Embassies here in Cyprus and complete so that your marriage will be recognized once you return to UAE.